Bryan Markiewicz, like many Delaware Tech students, attended college full-time while also balancing a series of part-time jobs. The SEED Scholarship helped to keep his educational costs low, and he graduated debt-free. “It was definitely a bonus to start a new career without having any student loans versus a lot of my friends who went to four-year schools and are still paying off debt,” he says. Although he wasn’t sure of his ultimate career goal, he thought an associate’s degree would help him find his path. He studied mechanical engineering technology and has great memories of bonding with his classmates, particularly on a final project when his team made a volleyball launcher. After weeks of fine-tuning, the finished product launched a volleyball harder than he had ever seen – more like dodgeball than volleyball! This type of hands-on learning helped Bryan to graduate and find a job from a posting on his department’s job board. 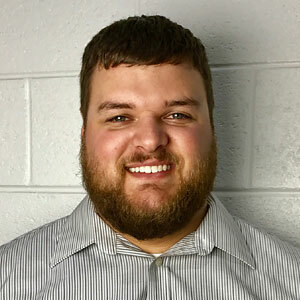 He worked as a manufacturing technician while continuing to attend college and earn a Bachelor’s degree in Business from Wilmington University. Now, he is about to begin a job as a Manufacturing Supervisor at Terumo Medical, and also plans to earn an MBA. Bryan is still connected with Delaware Tech, as a member of the advisory board for the Innovation and Technology Center. His manufacturing work experience helps him inform the College of best practices for real-world training. He says he hopes to stay connected to Delaware Tech for many years to come.